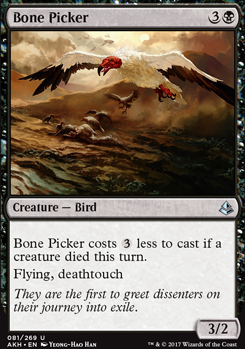 Bone Picker costs less to cast if a creature died this turn. Hey blakesmach1! Long time no see. 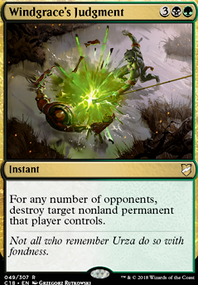 So in competitive play, enchantments are usually bad. 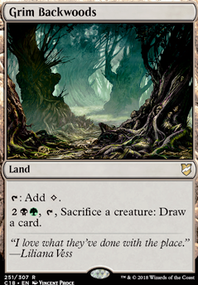 The opponent can cast a removal spell on the creature in which case the enchantment just fizzles and goes to the gy. (This is known as a 2-for-1) The only enchantments that see play are in Bogles decks or I've even seen a Starfield of Nyx deck once. But in general they are bad cards. Cartouches try to help this problem, but I don't think that's what I want to be doing at 3 cmc. Bone Picker is interesting. The only downside I see (besides Lifelink) is the that Vampire Nighthawk carries. This deck cares about Devotion to turn on Nykthos, Shrine to Nyx , Exsanguinate and the big finisher Gary . I don't see enough upside in Bone Picker to run it. If the deck takes a more Tempo approach, then it would be a sweet piece of tech. I like how your deck looks. 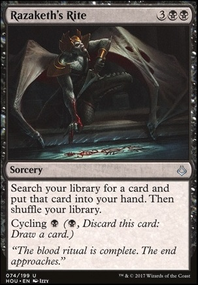 Would Bone Picker be a possibly better card than Vampire Nighthawk ? Yes you loose the life link but you could be casting it for. One swamp. And if you really want the life link could you add some Eternal Thirst ? Generally your card selection here is at too high a mana cost, no 1 mana spells is a big deal, especially when, off the top of my head; Viscera Seer , Mortician Beetle , Deathgreeter , Quest for the Gravelord and Thoughtpicker Witch all exist. Modern is a fast format, spells which cost 4 or more mana need to have significant impact to be playable, spells that cost less need to be the most efficient version. 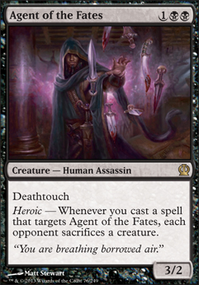 For example, you might think that these three cards would be ordered in playability thus: Murder > Victim of Night > Fatal Push , the opposite is actually true Fatal Push is the best of the 3, it is one of the best removal spells in Modern... In a deck focused on sacrifice though Tragic Slip is also a good choice. Cards like Grim Haruspex , Skirsdag High Priest and Bone Picker are ideal for this sort of deck as you net an additional benefit from the sacrifice. A card like Scavenger Drake can't be played until turn 4, Mortician Beetle is potentially there on turn 1. If you want a finisher in this sort of deck Demon of Death's Gate would be a classic option. Cards which can return themselves also have value Bloodsoaked Champion and Reassembling Skeleton would be examples. Try to organise the deck so that you have more 1 drops, than 2, more 2 than 3 etc, keep in mind though that functionally Bone Picker should be a 1 drop in your deck, so there is a little wiggle room. I hope this helps, good luck brewing your deck. Ouroboros_47 Do you think Bone Picker is better? 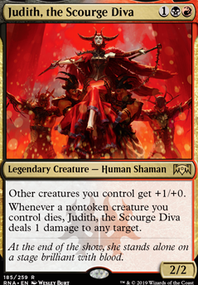 I've been wondering how many creatures there are in modern that require a certain condition to be met in order to cast them. I have found Myr Superion and Talara's Battalion that strictly follow this rule, while Epochrasite and Bone Picker can still be cast without having to meet their conditions. Thanks for all the suggestions, RedmundR2! 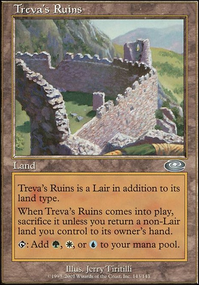 Your suggestions seem very powerful, but I purposely skipped over them when building this deck for budget reasons. As I said in my description, I have about a $75 cap, ad this deck has about $12 of wiggle room. Sadly, although insanely powerful cards, Phyrexian Obliterator and Bloodghast are too expensive for my build, but are great suggestions for anyone else building this deck. Victim of Night is probably my favorite removal spell, and was already in the deck. Nykthos, Shrine to Nyx, Gravecrawler, and Geralf's Messenger could be very interesting as 1/2-ofs, and I will most certainly test them out when I get a chance. I’ve had my eye on Fatal Push since it rotated out of Standard, and the price has been dropping, so maybe it’s time to finally slot it in here. Finally, Bone Picker could be a very interesting suggestion, and something I will definitely test out, but I might need more removal to make sure something dies. I don’t mean to sound rude or anything by declining some of your suggestions, but I have budget restrictions, so some won’t work out for me. You say that I should try to lower my curve and make this deck more aggressive, but I’m hesitant about that, as this is a more midrange deck that can go into the later game with cards like Pack Rat. Pack Rat has been amazing for me so far, so I don’t like the idea of taking it out until I test that more. The only real reason I beat against the bogles player was that I managed to kill of their bogles with my deathtouch creatures, and they couldn’t find more, so I won. Again, thanks for all the suggestions, and I’ll definitely look in to slotting some of them in here.